Day one of the Lotus Make-up India Fashion Week Autumn Winter 19 (LMIFW AW 19) had set the expectations high. There was the debut of designer Suket Dhir to look forward to, and a grand show celebrating Rahul Mishra’s 10 years in the industry. The line-up also promised a slew of young designers who were to blend traditional weaves with contemporary designs. Mishra’s designs formed the final showcase of the opening day of the Fashion Week. Mishra celebrated a decade of fashion with ‘Memory’, a show sprinkled with all that he has held dear over the years. The show also broke tradition in many ways. For starters it was held outside, open to the elements. With standing room only, and a ramp that seemed it could go on for miles, one could sense that it was something special. It was bright, it was fun, and vivacious and a capsule of Mishra’s journey and evolution as a designer. The Delhi-based designer’s mammoth show, featured many looks that have never been exhibited in India. Most were a throwback to the 10 collections he showcased in Paris. “The idea is to combine Eastern mysticism with Western meticulousness and highlight the overlap; so as to demonstrate that the world shares common ideas of timeless intricacy and elegance in fashion,” shared Mishra in a statement. Shades of mustard, orange, and yellow were juxtaposed with black, blue, red and white. Mishra used his signature intricate hand embroidery, appliquéd onto sheer gossamer fabric, organza and tulle, making the creations pret-worthy and wearable. The swarovski crystals, aari work in silk thread and French knots provided the necessary embellishments that are signatory of a Rahul Mishra ensemble. “My sacred relationship with metamorphic memories fuelled the shape-shifting level embroidery that defined my debut collection. Inspired by the tessellated prints of MC Escher’s woodcuts, these changing embroidery patterns seem to give the garment a life of its own,” stated Mishra. One saw jackets, tunics, fit-and-flare dresses. Ruffled and asymmetrical hemlines dominated the style story of the collection that featured both menswear and designs for women. From the looks of it, we will have dipping hemlines in vogue — especially where outer wear is concerned. Right from structured ones with enhanced, stiff lapels to free flowing, anti-fit ones with boxy sleeves, jackets ruled the roost. 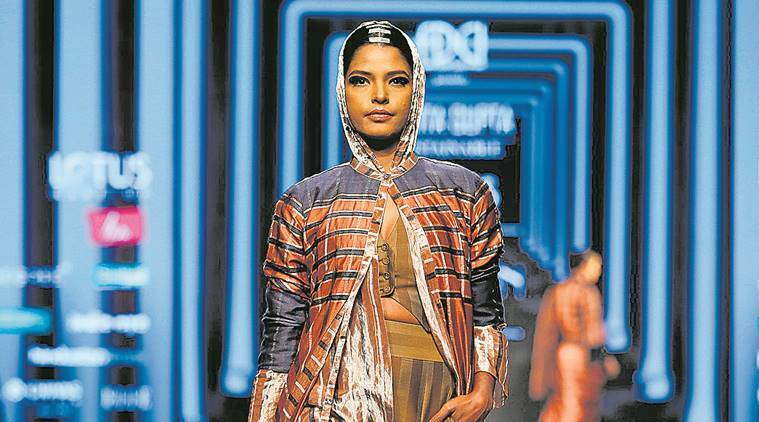 Amita Gupta, who, with her label Sustainable, blends silk and sari with denim, presented long flared jackets with hoods, which were paired with saris. Mumbai-based Diksha Khanna presented ‘Hadith’, inspired by her travels to the Arab lands and her meanderings in the various medinas and souks, and brought wrap-jackets and crocheted bomber numbers to the ramp. Khanna blended khaki and denim, and used crocheted patchwork techniques and cross stitch embroidery to add drama to her jackets and creations. Knee-length Maheshwari silk jackets with plaid lining were presented by Pratima Pandey, under her label Pramaa, though her collection was very reminiscent of Pero, by Aneeth Arora. Designer Sahil Kochhar, too, invoked the knee-length jacket, in bright floral prints of blue and yellow, which he had created for the LivaEco Green heart show.